Now, however, that pluralism is at risk. We seem headed toward an economy of red brands and blue brands, red employers and blue employers, with no common ground. After 20 years, the big Outdoor Retailer trade show is leaving Salt Lake City — not because it ran out of space or got a better deal elsewhere but because Utah lawmakers opposed an expansion of the industry’s biggest federal subsidy. “Utah elected officials do not support public lands conservation nor do they value the economic benefits — $12 billion in consumer spending and 122,000 jobs — that the outdoor recreation industry brings to their state,” Rose Marcario, the president and chief executive of Patagonia, declared in a statement announcing that her company would no longer attend the Salt Lake City show. Other industry leaders, including Polartec and Arc’teryx Equipment Inc., quickly joined in. Then two weeks ago, after a conference call with Utah Gov. Gary Herbert that ended on a “curt” note, the show’s organizers said they’ll go elsewhere when their contract expires next year. Colorado is campaigning for their business. At issue is the December designation of 1.35 million acres of federal land as Bears Ears National Monument. 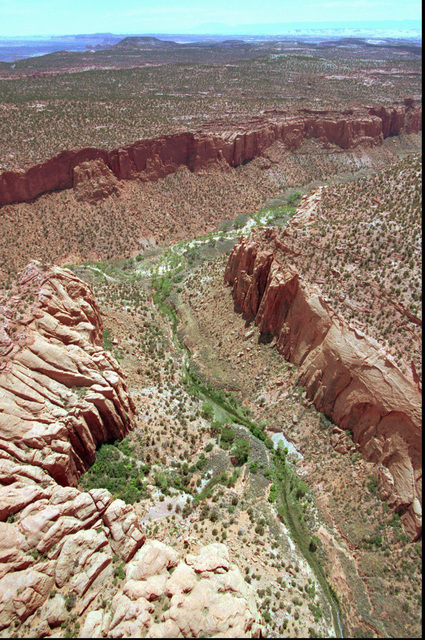 How to preserve the area has long been a contentious subject in Utah. President Barack Obama’s late-term action thrilled environmentalists and tribal leaders, upset ranchers and other rural residents, and thwarted oil and mineral development and the blue-collar jobs it might mean. The Republican governor, legislature, and congressional delegation all opposed the designation. In response, the legislature passed a resolution calling on the Trump administration to reverse Obama’s decision. When the governor signed it, calls for the boycott began. Since it frankly acknowledges that its sales depend on public lands, is the outdoor industry applying a moral veneer to its quest for profits? Or is it using a corporate fig leaf to promote managers’ political views? The two motives are in fact impossible to separate. As with the union movement, the industry’s financial interests are inextricable from its social values. As I’ve previously written, the industry is one example of a much larger cultural and economic phenomenon: the shift from function to meaning as a source of economic value and, with it, the melding of consumption, politics and identity. What we buy increasingly expresses who we are. Brands built on specific political or cultural values will inevitably take public stances, using their economic clout to influence public policy, whether out of genuine conviction, cold-eyed market positioning, or both. It’s not surprising that Patagonia Inc., the outdoor apparel brand most prominently built on its political stances, led the anti-Utah charge. The bigger question is whether in the Trump era brands that aren’t traditionally political will feel forced to choose sides. Overtly political shopping is on the rise. Every week seems to bring a new boycott: against North Carolina over its bathroom bill, Nordstrom Inc. stores because they carry — or discontinue — Ivanka Trump’s merchandise, Kellogg Company for dropping ads on Breitbart News, Under Armour Inc. for its chief executive’s nice words about Donald Trump, Starbucks Corporation for pledging to hire refugees, and on and on. Wegmans Food Markets Inc. recently sold out of Trump Winery products in Virginia. The reason: calls for the chain to drop the wines, which produced a pro-Trump backlash. Wine, breakfast cereal, workout clothes and business apparel aren’t inherently political goods. Brand choices choices may reflect largely unconscious tribal affinities, but they allow some play. You can eat organic food and vote Republican or drive an SUV and vote Democratic. Conservatives can enjoy Meryl Streep and liberals can esteem Clint Eastwood. “Vote right, live left,” an urbanite conservative advised me many years ago. Despite Trump’s frequent attacks on Jeff Bezos, Americans of all stripes like Amazon.com. Now, however, that pluralism is at risk. We seem headed toward an economy of red brands and blue brands, red employers and blue employers, with no common ground. In this context, the outdoor industry’s action is a disturbing bellwether, as is the increasing partisanship of once-evenhanded fashion magazines like Vogue. Outdoor activity appeals to Americans of all political persuasions, and the country’s western landscape has long helped define the national identity. People can disagree over how best to enjoy and protect that landscape, and how to weigh preservation against other values, while still sharing much in common. Enforcing the party line by declaring an entire state off limits is an extreme step. Here Jew, Mohammedan and Christian deal with each other as though they were all of the same faith, and only apply the word infidel to people who go bankrupt. Here the Presbyterian trusts the Anabaptist and the Anglican accepts a promise from the Quaker. On leaving these peaceful and free assemblies some go to the Synagogue and others for a drink, this one goes to be baptized in a great bath in the name of Father, Son and Holy Ghost, that one has his son’s foreskin cut and has some Hebrew words he doesn’t understand mumbled over the child, others go to their church and await the inspiration of God with their hats on, and everybody is happy. Once the great solvent of difference, commerce threatens to become its enforcer. And everyone is unhappy. Virginia Postrel is a Bloomberg View columnist and former editor of Reason magazine.